New Sinkane Record + video announced! I spent the last year working on the new Sinkane record, which we recorded last summer in El Paso, TX in an amazing studio called, Sonic Ranch. I got to play pedal and lap steel, guitar, and organ! It was a great experience! The record is getting released and here’s a video to celebrate, along with a mess of tour dates! Comments Off on New Sinkane Record + video announced! 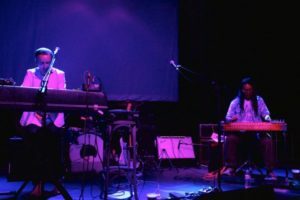 I have been working with great friend, Alexis Taylor of Hot Chip, on and off since we met at the beginning of the William Onyeabor project. His voice is gentle, yet powerful, and he is an incredible live performer. Here is a little review from one of our early shows in Brooklyn, New York almost 2 years ago! Its been an honor and privilege to play with him, I feel like my pedal steel and his voice compliment each other nicely. Honeyfingers has a bunch of VAULT recordings and they are going to start being released over the next few months. Here is our take on the HAwaiian classic, SAND. Put it on loud and put some sunglasses and Locals on, and let my lap steel take you away from this Brooklyn winter. Comments Off on New Hawaiian music! Sinkane At The South Bank Centre, London, UK. I played some pedal steel and guitar with Sinkane at the Southbank Centre in London and we got a few clippings! Check em out! and a cool photo series! Comments Off on Sinkane At The South Bank Centre, London, UK. Canvas did a short documentary about William Onyeabor and us, the Atomic Bomb Band leading up to the show at the Southbank Centre. Check it out! I get a little cameo and a clip of me playing the ol sparkle stratocaster guitar.